The opinions expressed in this article are just of author's himself, and not of Security Gladiators. 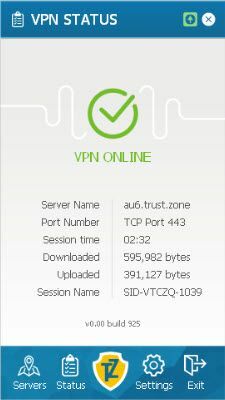 I’ve only been using it for a just under a month now and from what I’ve seen so far, it’s a decent VPN provider. Mostly using it for watching TV shows and watched the FIFA Women’s World Cup on a Canadian HD screen while using it out of Beijing. Haven’t had any buffering issues and usually end up getting an HD stream for most streams that I watch from Spain, the UK and the US. I only started using VPNs after taking up a job here and I’m likely to carry on using Trust.Zone VPN if this quality holds up, I’m likely to follow up with the 1 year plan which has a good pricing plan. I haven’t tried other services much so can’t say how this will pan out but so far so good, I suppose. I usually use Hola unblocker while surfing websites and watching TV shows on Chrome but needed an overall VPN solution for my laptop and devices (an android phone and an iPad). The connection got a little slower while streaming on my iPad so don’t use it for watching any videos, sticking to that with my laptop. The support team only got back to me after a couple of days so that has me concerned a bit when trying to find solutions for getting the VPN to work quickly on my iPad. Otherwise, browsing and using Skype etc. is pretty decent, have little to complain about. I’ve been switching between different security protocols but mostly stick to using Open VPN. When speeds are really down and out, I switch over to PPTP but haven’t found too many reasons to do so recently. I’ve been switching between a few servers when one or more start to go a little weak with their bandwidths on offer so that’s a minor gripe. I’ve used it for a few banking transactions and that’s gone through without a glitch. I barely use it at work and only have it running on my laptop and mobile devices but so far, so good. 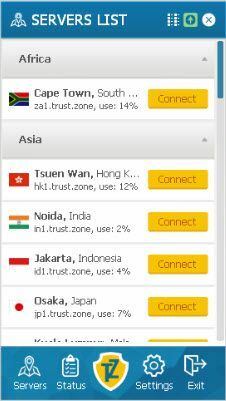 I’m actively looking for alternatives too, even though Trust.Zone VPN was the first I used and signed up for. I do it to check if there are any better offers and pricing plans. The one month plans are steep but the longer plans are cheaper, and I’ve got trepidation about signing up for the long haul. Small number of servers that do not show loading. Regular choking to have slow download speeds, some servers such as Hong Kong provides less than 2 Mbps constantly. Australian Servers are constantly down.Office hours customer service… NO Thanks! Easy usage, variety of servers, quick connection start. TRUSTZONE is intelligent, well-engineered and gives me the peace of mind that is so elusive these days on the dark net. whose knowledge and tech savvy is minimal can use and appreciate TRUSTZONE efficacy. honestly i have tried many other vpn services trials periods and they were awful. Trustzone’s free test period is the only one that had consistent high speeds without any drops or any other problems. Cela fait maintenant des mois que j’utilise TRUSTZONE et je n’ai que du bien à en dire. Simplicité, fiablité, rapidité, nombreuses possibilités. Les prix sont très corrects pour le service, l’équipe est très réactive, serviable et fort sympathique. Que demander de plus ?